Ben Ainslie jest mistrzem olimpijskim w klasie Finn. After what he has described as the hardest week of his life, Ben Ainslie (GBR) took the overall lead in the Finn class for the first time today to take the gold medal in the London 2012 Olympic Sailing Competition. The leader all week, Jonas Høgh-Christensen (DEN) trailed Ainslie at every mark to lose his stranglehold on the gold. The bronze finally went to Jonathan Lobert (FRA) after winning the medal race. Høgh-Christensen had the advantage over Ainslie out of the start forcing the Brit to tack off to the right, the normally unfavoured side. The left has been favoured all week, but Ainslie through luck or judgement found a shift back to be ahead of the Dane at the top mark, though both were deep in the fleet. Ivan Kljakovic Gaspic (CRO) led from Jonathan Lobert FRA) at the top mark. The puffy condition enabled Ainslie to fly down the first downwind to round in second behind Lobert. As the wind went lighter Høgh-Christensen tacked off to the right and Ainslie followed. It was nearly his undoing. The two dropped back to ninth and tenth in the race. As Lobert extended away from the fleet, on the final beat, the left side came in big and Pieter-Jan Postma (NED), the only other man who could take gold, made a spectacular recovery to round in third. He was one place from taking gold as the fleet approached the final downwind mark before the short reach to the finish. Unfortunately he pushed too hard, picked up a penalty and after doing his turns was back in fifth and out of the medals. Ainslie had stuck to Høgh-Christensen. Being so far back in the fleet all he could do was make sure he stayed in front. He stayed there to the finish to claim the gold medal to the deafening roars of the local crowd. It had been a suspense filled race, made even worse by the unstable puffy winds, with sailors moving up and down the fleet, and they all kept us guessing to the very end. It was a made for TV thriller. 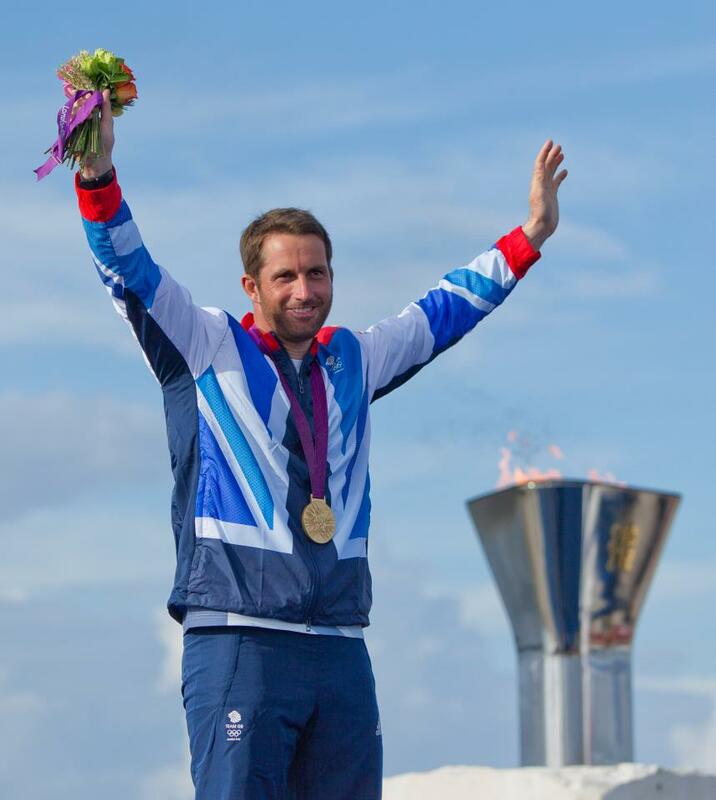 In winning gold Ainslie becomes the most decorate Olympic sailor of all time. It was watched by thousands in the sunshine invent Nothe. Thousands more were in the public access areas around it on on the live beach site And millions around the world also watched it. It probably had the largest TV audience of any sailing race in history. And if suspense and tension make good TV then this race had it all in bucket loads. Great Britain has taken the Finn class gold medal for the fourth time running and with ample talented sailors to take up Ainslie's mantle this run isn't over yet. France wins the bronze again after Guillaume Florent won it in Qingdao, Lobert also repeating the feat in Weymouth by snatching it in the final race. At the medal ceremony tonight the medals were presented by HRH The Princess Royal and the flowers were presented by HM King Constantine. It's been brewing all week and has gone right down to the wire. The on-the-water – and sometimes off-the-water – battle between Jonas Høgh-Christensen (DEN) and Ben Ainslie (GBR) will reach its exciting conclusion on Sunday when the Finn class medal race takes place. The final showdown between Høgh-Christensen, the double world champion at his third Olympics, against Ainslie, the three time Olympic champion and six time Finn world champion, has ignited the worldwide press as they slaver over the prospect of the most momentous dinghy race in history. There is a lot at stake. If you didn't know by now Ainslie is hunting for his fourth consecutive Olympic gold medal to become the most decorated Olympic sailor of all time, surpassing the original Great Dane Paul Elvstrøm's four gold medals between 1948 and 1960. There is also a slight sense that Høgh-Christensen is defending Elvstrøm's record and honour. Both are already all but guaranteed medals – the medal race will decide the colour. Høgh-Christensen was the early pace setter when the Finn racing started last Sunday, winning the first three races to the backdrop of a shocked British audience concerned that their golden boy perhaps wasn't up to the job. Høgh-Christensen has led the competition from the first mark of the first race and still leads going into the medal race. A lot of questions were asked of Ainslie as to what was going on, but he didn't have the answer in the first half of the week. His answer finally came on both of the two final days of the opening series as he clawed back his points deficit and showed some of his true form to go into the medal race effectively level with the Great Dane Mk 2. During the half-way stage lay day, something changed in Ainslie. He came back out with gritted teeth, looking determined to stop to the downward spiral. But it still wasn't easy, fighting his way back twice from lowly positions at the top mark. But that is what has made him famous, making incredible comebacks against adversity, and this is what was lacking in the first half of the week. The best scorer in the second half of the week was in fact Pieter-Jan Postma (NED) with a 2,2,1,2 scoreline, lifting him to the bronze medal position. One of the best sailors in recent years he has never won a major championship but picked up a silver medal at the 2011 world championship and a bronze at the 2011 Olympic Test Event. He is no pushover. Høgh-Christensen and Postma have also been vilified in the British press after the race eight mark touching incident – the Great Dane has even been marked as Public Enemy No 1 in the UK – but the disagreement appeared to be forgotten on Friday as a cheerier Ainslie moved within the vital two points of Høgh-Christensen, effectively cancelling any points advantage. It has set up a thrilling winner takes all scenario on Sunday, providing they finish within the top seven boats. What can we expect from the medal race? Some pundits are already looking forward to an Ainslie trademark match race, but realistically this is unlikely to happen as they both need to keep half an eye on Postma. In fact there will probably be two, or even three, races going on. The first will be between Høgh-Christensen and Ainslie as whoever is in front will no doubt cover the guy behind pretty tightly. Expect to see them start close together but sail their own races until it is under control. Unless Postma decides to take a risk – and his style is to attack rather than defend – the second race will be for the bronze with him trying to protect his five point lead. On the water this means he needs to be within two places of Jonathan Lobert (FRA) and Ivan Kljakovic Gaspic (CRO) and within three places of Vasilij Zbogar (SLO). Realistically Postma could inflict damage on one of his opponents and go for the gold, but to do it to both is a tall order while also protecting his position against three other boats, all eager to fill the gap should he falter. So what are their chances? On paper, and before this week started, the wise money would be on Ainslie. His record in these situations is outstanding and no one else has got close to converting tense showdowns into convincing victories. But this week Høgh-Christensen has inflicted seven defeats on Ainslie out of 10 races. That is something to stop and think about. Ainslie may have turned it around in the second half of the week, but those defeats will have rubbed a sore wound in the three time Olympic champion's mental armour. Also compare the indignantly angry Ainslie from Thursday against the outwardly calm and collected Høgh-Christensen. Two very different characters who thrive in different ways. Who will be more focussed on the job? Who will best survive the enormous pressure that both will be under? Ainslie wasn't giving much away, “It's going to be a fascinating race; I'm really looking forward to it. It's hard to call tactics yet. It depend on the conditions and what sort of mood you are in when you get out of bed in the morning. Assuming Høgh-Christensen and Ainslie will fight for the gold and silver, there is a four way fight for the bronze. There is only so much Postma can control so most likely he is going to have to sail his own race. Lobert won the silver at the 2011 Olympic Test Event; Kljakovic Gaspic has won two European Finn titles; Zbogar has already won two Olympic medals in the Laser class. All are extremely competitive sailors and with such a small points gaps between the four, nothing is certain. Whatever happens out on the water on Sunday afternoon, the conditions here this week have been exactly what sailing has needed to improve its image. The world has finally seen sailors as athletes, and perhaps finally understood the physical and technical demands of the sport. There have been strong winds, big waves, agony of sailors and pain of defeat. Viewers have watched as sailors have stretched every muscle and sinew for that extra point of speed, seen the extreme boat handing skills required to keep the boats upright and lived the challenge of winning an Olympic medal. It has been a breath of fresh air. So far it has all been positive news. Sunday's medal race though could well be the sailing event of the year. Don't miss it. Dzień piąty (piątek), dwa wyścigi (9 i 10). Wyścig dziewiąty: wygrał Pieter-Jan Postma przed Vasilijem Zbogarem i Jonathanem Lobertem. Dwaj faworyci regat: Ben Ainslie zajął 6 miejsce a jego rywal, prowadzący w regatach Jonas Hogh-Christensen miejsce piąte. Wyścig dziesiąty: temperatura tylko 16 stopni, wiatr 11 kts z kierunku 210. Po ponad godzinnej fantastycznej walce wygrywa z dużą przewagą Ben Ainslie przed Pieterem Postmą i Jonasem Christensenem. Przewaga duńczyka maleje do 2 punktów. Jonas ma 26 a Ben 28 punktów. Wszystko teraz rozstrzygnie sie w niedziele w wyścigu medalowym. Piotr Kula zajmując miejsca w wyścigach odpowiednio 14 i 16-te po dziesięciu wyścigach zajmuje w regatach 16 miejsce. Niestety nie popłynie w wyscigu medalowym. 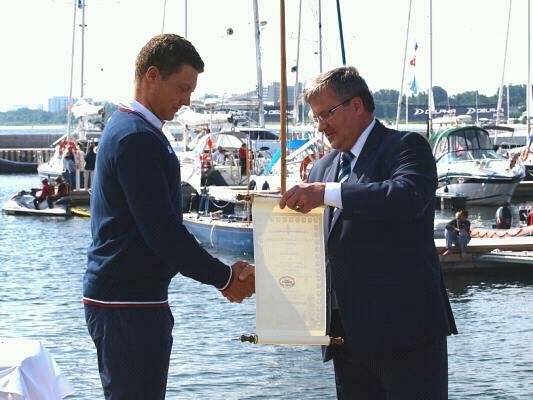 Jonas Høgh-Christensen (DEN) has led the Finn class at the London 2012 Olympic Sailing Competition from the very first mark. He will go into the medal race on Sunday with a two point lead over defending Olympic champion Ben Ainslie (GBR). After the best showing on Friday, Pieter-Jan Postma (NED) moves up to the bronze medal position. The gold medal will come from one of these three. In practice this means that whoever out of Høgh-Christensen and Ainslie finish ahead of the other wins the gold medal providing they are in the top seven boats. Postma can mathematically win gold but needs to put at least six boats between himself and both the others. Realistically that is unlikely to happen, so the gold is really down to the Dane and the Brit. With tempers and egos bubbling over, the Finn fleet set out for the final opening series day. Høgh-Christensen (DEN) held a scant three point lead over defending Olympic champion Ainslie. After a difference of opinion between them yesterday everyone expected fireworks on the water, but it didn't quite turn out that way. Of the two of them, the Dane made the best of the start of race nine and, with the fleet heading to the left yet again, the pin end was bunched up. Høgh-Christensen did well on the left, forcing Ainslie to tack off, with Pieter-Jan Postma (NED) doing well on the right. As they approached the top mark Ainslie had trouble finding a clean lane and trailed round in ninth. Ioannis Mitakis (GRE) led round from Postma, Brendan Casey (AUS) and then Høgh-Christensen. By the gate, Postma had worked out a 50 metre lead and he comfortably extended away to win his first race of the series. Behind him there was a tense battle with bronze medal positioned Ivan Kljakovic Gaspic (CRO) making a huge gain on the downwind to move from 19th to fifth at the gate. Jonathan Lobert (FRA) also gained to second with Vasilij Zbogar (SLO) close behind in third. On the final beat Postma pulled further away while Zbogar found his way into second. Nothing much else changed in the closing stages except Kljakovic Gaspic moved into fourth from Christensen while Ainslie took three places on the final downwind to finish one place behind the Dane. The net result of this was the Høgh-Christensen had extended his lead by one crucial point on Ainslie. Kljakovic Gaspic was still in the bronze medal position but the points were now really tight. The last opening series race was going to be crucial for all of them. There was also the not so small matter of making the cut for the medal race and some sailors were looking rather precarious. For the final opening series race Postma and Ainslie started well by the pin while Høgh-Christensen was forced to tack away. Postma went furthest left and came back just above Ainslie, while Høgh-Christensen was struggling out to the right. As they approached the top mark it was clear that the left was still paying and Postma rounded first from Ainslie, Greg Douglas (CAN), Mitakis, Rafa Trujillo (ESP), and Høgh-Christensen. While Ainslie soon passed Postma and just sailed away from the fleet, Høgh-Christensen put on a surge to pass four boats and round the gate in second, but nearly a minute behind Ainslie. On the second beat, Ainslie slowed up for a while and looked to be waiting for the Dane. He would have liked to have one boat between then to make life easier in the medal race. But Postma found a way past and Ainslie carried on. Ainslie rounded the top mark with a 90 metre lead and led down to the finish. Postma was not about to make the same mistake twice and held onto his second place, while Trujillo briefly threatened Høgh-Christensen on the final run. The single point was just as important to Postma as it was to Høgh-Christensen. At the finish Ainslie led by a considerable margin while Postma held on to second. Høgh-Christensen had to settle for third with Trujillo fourth. Casey sailed his best race of the series with a fifth but it was too late to make the medal race. However Trujillo’s fourth place was enough to make the cut, relegating Deniss Karpak to 11th. So, into the medal race on Sunday Høgh-Christensen will lead Ainslie by two points while Ainslie leads Postma by 14 points. Crucially, they have a 21 point and 19 point lead over Lobert and Kljakovic Gaspic, which means they are all but assured a medal, just the colour needs to be decided. Postma meanwhile has a five point lead over Lobert and Kljakovic Gaspic with Zbogar just two points behind. The medals will all come from these six sailors. The medal race will be sailed in front of the Nothe spectator area on Sunday at 14.00. Ben Ainslie (GBR) returned to winning ways on the fourth day for Finns at the London 2012 Olympic Sailing Competition in Weymouth with a first and a third to narrow the gap on regatta leader Jonas Høgh-Christensen (DEN) to just three points. Ivan Kljakovic Gaspic (CRO) moved up to third. The second race of the day was won by Rafa Trujillo (ESP). It was a big day out on Weymouth Bay South course with big winds, big waves and bigger stakes. For Ainslie it was crucial that he started to narrow the points gap and he did just that. Today was the day that he had to make his move on Høgh-Christensen before it was too late. The Brit was fast running out of races to reverse the points score and he came out looking more confident and dominant that at any time this week. He owned the start of race seven, locking into the dangerous pin end position early and controlling it with perfection until the gun. The Dane was just to windward and just a bit back from the line, but his problem was the Polish boat that was ahead and on his wind. Piotr Kula (POL) was OCS, but he damaged Høgh-Christensen's start enough so that he had to tack to get clear air. Ainslie controlled the left along with Rafa Trujillo (ESP) and Pieter-Jan Postma (NED) and they rounded the first mark in this order with Vasilij Zbogar (SLO) in fourth and then Høgh-Christensen. With big wind and big waves the reach to the wing was a spray filled sleigh ride. The Dane slid into fourth, and then after rounding the mark dived low to get some separation from the leading bunch. Then disaster struck as he capsized on a big wave. He was up and sailing again in 30 seconds but looked clearly rattled as he rejoined the race in 15th. At the front Ainslie and Postma were battling for supremacy downwind in the big conditions, rounding opposite gates. Postma briefly got in front of Ainslie at the next top mark but Ainslie soon passed him downwind to extend and win his first race of the week by some 20 seconds from Postma. Ivan Kljakovic Gaspic (CRO) crossed in third with Tapio Nirkko (FIN) in fourth. Third overall Jonathan Lobert (FRA) was fifth. Høgh-Christensen was back up to sixth at the top mark but dropped two on the downwind to cross in eighth. Early performer Trujillo had gear problems downwind and dropped to 15th at the finish. The British breathed a collective sign of relief. Ainslie had turned the corner and put a bullet on the scoreboard. More importantly for Ainslie, Høgh-Christensen now had to count his seventh from Monday so the points gap was down to just four. Onto race eight and Høgh-Christensen was back on the offensive, winning the favoured pin end of the line, though he had Trujillo just to windward off him. Ainslie started slightly further up the line but was soon forced to tack off to find a lane. The fleet again favoured the left side with Ainslie heading furthest left when the leaders crossed back. Round the top mark Trujillo led from Høgh-Christensen, Postma, Nirkko and Ainslie. The Brit went low on the reach and moved up to fourth and then also overtook Postma on the run. At the gate the top four boats rounded the same mark within 10 seconds of each other with a nice gap on the fleet. Soon after the rounding Ainslie did a penalty turn and lost ground. Høgh-Christensen took a hitch to the right and tacked on Ainslie's wind. Again the fleet went all the way to the port layline. Trujillo held onto his lead to round ahead with Høgh-Christensen and Postma holding a small lead over Ainslie. The final downwind to the finish was a thrilling battle. Høgh-Christensen immediately made inroads into Trujillo's lead while Ainslie tried to find a route past Postma so he could attack the Dane. But it was Postma who made the first move going wide and then crossing on front of Høgh-Christensen and Ainslie. Round the last mark it was Trujillo and Postma with Ainslie just sliding round the mark ahead of Høgh-Christensen. Nothing else changed by the finish with the 2004 Silver medalist Trujillo winning the race from Postma. Ainslie had taken around 70 metres about off regatta leader Høgh-Christensen on the run to inflict his second victory over him in one day and further close the points gap. A fourth and a fifth leaves Nirkko in seventh place just 14 points off the medals. “In the first race I didn't get a very good start so I had to tack away behind the whole fleet, so I was on the wrong side and struggled on the first upwind. After that I eased the clutch and just let it go. The reach and the first downwind were good. Nothing much happened on the second upwind but the second downwind was excellent. I think I got better pressure and was a bit more on the inside inside.” Nirkko went from 11th to fourth on the run, after rounding the top mark 21st. There is one more day of the opening series left before Sunday's double points non-discardable medal race. Today was proof, if we needed it, that it will be a fight all the way to the finish. Ainslie was more aggressive today, appeared to be faster upwind, made fewer mistakes and was blisteringly fast downwind. He seems to have overcome the lacklustre performance of the first three days and refocussed on the job in hand. Høgh-Christensen by contrast made several mistakes and the capsize in race seven may hang over him in the days that remain. Two more opening series races remain and today's change in fortunes has set up a thrilling match between these two amazing sailors. We can't wait. Races nine and ten are scheduled for 12.00 Friday, on Weymouth Bay South course. piąty wyścig wygrał Jonas Hoegh-Christensen przed Zachem Railey i Tapio Nirkko. Piotr Kula był 13-ty a Ben Ainslie 4-ty. W szóstym biegu zwyciężył Dennis Karpak przed Jonasem i Benem Ainslie. Piotr Kula w szósty biegu zajął 20 miejsce i jest po sześciu wyścigach na siedemnastej pozycji. Informacja otrzymana od Roberta Deavesa. Jonas Høgh-Christensen (DEN) has again extended on the Finn fleet with a first and second on day three at the London 2012 Olympic Sailing Competition. Ben Ainslie (GBR) moves up to second after a better day, but has still be beat the Great Dane after six races. Jonathan Lobert (FRA) drops one place to third. The second race of the day was won by Deniss Karpak (EST). Tuesday was crunch day for the Finns. Going into the half way stage of the regatta, Ben Ainslie (GBR) needed to make some points back before the lay day on Wednesday, while regatta leader Jonas Høgh-Christensen (DEN) was looking to consolidate his points lead and not do anything silly. Race five was dominated by the Høgh-Christensen from start to finish. Starting in the pack, but away from the pin-end boat he hit yesterday he soon pulled ahead of the fleet and with Postma suffering gear failure on the far left, the Dane steered a confident course up the favoured left side of the course to round the top mark with a small lead over Rafa Trujillo (ESP), Ben Ainslie (GBR) and Zach Railey (USA), while several boats overstood in the strong tide. Ainslie had started in the middle and was soon in difficulty having to tack away to clear his air. After a screaming reach towards the wing mark as the wind piped up, there was a fascinating dual between the leading bunch on the run, though Høgh-Christensen was starting to pull away from the fleet. Railey, the 2008 Silver medalist has not had a great regatta so far so was also looking for improvements today. He had moved up to second at the gate, sailing past the normally faster Ainslie. Ainslie rounded behind and had to tack away to find a lane further to the right. Høgh-Christensen seemed confident on the left and held his course before coming back with a nice lead into the second top mark. The wind faded on the final offwind legs but Høgh-Christensen extended his lead, while Railey maintained second from Trujillo. Nirkko and Ainslie passed Trujillo and Ainslie looked to be closing on Nirkko but ran out of track. At the finish it was Høgh-Christensen, Railey, Nirkko and Ainslie, with Ivan Kljakovic Gaspic (CRO) staging an amazing recovery from 19th at the first mark to cross fifth. Ainslie was now firmly on the backfoot and needed something special in race six. He started well, winning the pin after Postma returned and controlled the lane to the favoured left side of the course and looked to be coming into the top mark well placed. Meanwhile Høgh-Christensen was forced to tack off to find clear air and trailed on the right. However many boats overstood the top mark and first round was Trujillo from Ioannis Mitakis (GRE), Nirkko and Høgh-Christensen. Ainslie rounded in seventh. Trujillo led down the run with Deniss Karpak (EST) moving up to second from Nirkko and Ainslie, but by the gate Karpak had made big gains to round in first from Nirkko, Ainslie and Høgh-Christensen. The Dane was forced to tack away again after he had been passed by Ainslie for the first time this week. However it was all change on the final upwind with Høgh-Christensen splitting from the fleet and making places all the way up to second to round behind Karpak. Trujillo rounded third from Vasilij Zbogar (SLO) while Ainslie slipped to fifth. Karpak extended down the run to lead into the finish and win by nearly a minute. Høgh-Christensen rounded in second but Ainslie had caught up for a thrilling spray filled chase to the line, but the Dane held on for second with Ainslie third, Trujillo fourth and Zbogar fifth. Despite dropping one place to third, Lobert said, “I am pretty happy so far. Third overall after three days means I am still in the game. We still have four races to go and so I will take it day by day, race by race like I have done since the beginning. And I always try my hardest to catch up the most boats I can when I am behind. Today I was 15th and 17th at the first mark which is not so good.” Lobert recovered to place 6th and 7th today. Høgh-Christensen said, "In both races I wanted to go left. So starting close to the pin was the plan but with a bit less risk. Both starts were good, but I thought I was over in the second race and went back. The reason being that I was on line with PJ and he went back. Apparently non of us were over. I came back fast and managed to hit some good shifts to get back to fourth. Then I gained a couple more and I am super content with that. Another good day." The Finns now have a rest day - and a day to think about how they will approach the final four opening series races on Thursday and Friday. While one man will be trying to relax and keep his head clear, another will be evaluating what has gone so wrong. Ainslie may be in the silver medal position but he has openly admitted anything but gold would be a disaster. And after six races he sits ten points behind the Dane with a little bomb on his scorecard waiting to be ignited if he has another bad day. Høgh-Christensen is producing the type of performance that everyone expected Ainslie to produce. Some great race wins, all round speed dominance and some incredible comebacks. What does Ainslie now have to do to turn this around? And does he know the answer himself? How do you respond to someone sailing the way Høgh-Christensen has done? This is an unsual situation for Ainslie as normally it is the rest of the fleet working out how to respond to Ainslie's dominance. It will be fascinating to watch it play out. After the rest day for the Finns on Wednesday, races seven and eight are scheduled for 12.00 Thursday, on Weymouth Bay South course. W trzecim wyścigu Piotr zajął 17 miejsce. W wyścigu czwartym 16 miejsce. The Finn man of the moment Jonas Høgh-Christensen (DEN) extended his lead on day two in the Finn class at the 2012 Olympics in Weymouth, and, while Jonathan Lobert (FRA) moves up to second, there is a four way tie for third place. Race wins went to the Dan Slater (NZL) and Daniel Birgmark (SWE). It was another windy and beautiful day in Weymouth with sunny skies and 14-16 knots of breeze in the morning. The Finns sailed two great races in the Weymouth Bay West course and there was plenty of drama to keep the viewers happy. Race three belonged to Dan Slater (NZL). After having to wait a long time to have his national selection for these Games confirmed, he has proven his ability with a stunning performance in testing conditions to dominate and win race three by nearly 30 seconds. He rounded the top mark with a narrow lead from Pieter-Jan Postma (NED) and Ioannis Mitakis (GRE) and extended on every leg. By the bottom mark Mitakis had dropped down the fleet while overall leader Jonas Høgh-Christensen (DEN) had climbed to second, with Postma in third. Ben Ainslie (GBR) climbed up to fourth on the run but lost places upwind again and finally finished in sixth. The top three remained the same with Slater extending to win by half a minute. Third overall Ivan Kljakovic Gaspic (CRO) recovered from 14th at the top mark to seventh at the finish. The fourth race was full of drama. First Høgh-Christensen hit the pin end on the start and after rerounding headed out right to clear his wind, but in last place Ainslie also had a bad start and at the top mark the two regatta leaders were 14th and 21st. At the front Tapio Nirkko (FIN) rounded first from Daniel Birgmark (SWE) and Rafa Trujillo (ESP). Nirkko then capsized at the downwind mark, though recovered his boat quickly and rejoined the race in sixth. Then Trujillo also capsized after his rudder popped off. The new leader was Jonathan Lobert (FRA) who had moved into second on the downwind. Lobert held onto the lead round the next windward mark but the fleet had compressed slightly with Høgh-Christensen making the biggest gain to round in seventh. He had taken more than a minute from his deficit on the first leg to trail the new leader by just 30 seconds. Ainslie had dropped to 12th, another 30 seconds back. Two offwind legs remained to the finish, and it was a great test of stamina and strength, as well as a thrilling finish. With the wind increasing to 18-19 knots Birgmark powered down the run and just sneaked round the leeward mark ahead of Lobert to scream down the final reach to take the winner's gun. Lobert crossed three second later with Vasilij Zbogar (SLO) another two seconds later in third. While Kljakovic Gaspic moved from 13th to ninth, neither Høgh-Christensen nor Ainslie could make any gains. However a seventh for Høgh-Christensen was easily enough to retain the overall lead by eight points from Lobert, with Ainslie, Kljakovic Gaspic, Postma and Zbogar all on equal points, three points further back. Races five and six are scheduled for 12.00 Tuesday, both on Weymouth Bay South course, with a rest day on Wednesday. Piotrek Kula DSQ w pierwszym wyścigu i 16-ty w drugim. Po dwóch wyścigach na 21 miejscu. Oto co o pierwszym dniu regat pisze ojciec Piotra Jarosław Kula. Po inauguracyjnym dniu żeglarskich zmagań olimpijskich w klasie Finn Piotr Kula plasuje się na 21. pozycji. W pierwszym wyścigu zawodnikowi nie udało się osiągnąć mety, natomiast drugi pojedynek ukończył na 16. miejscu. - Miejmy zatem nadzieję, że swój limit pecha na igrzyskach wyczerpał i teraz będziemy widzieli już Piotra takiego, jakiego poznaliśmy ostatnio przy okazji Mistrzostw Świata - mówi Jarosław Kula. Pierwszy dzień wyścigów w klasie Finn na Igrzyskach Olimpijskich za nami. Piotr świetnie rozpoczął swoją rywalizację. Po dobrym starcie i uważnej żegludze na pierwszym kursie pod wiatr, boję nr 1 minął jako szósty zawodnik floty. Wiał dość silny i porywisty wiatr. Sędziowie, zgodnie z przepisami klasy Finn dopuścili w żegludze z wiatrem pompowanie. Po okrążeniu pierwszego znaku Piotr rzucił się do ataku. Pompując żaglem gnał z wiatrem i wyprzedził dwóch rywali choć sam też został wyprzedzony przez Bena Ainslie. Przed "bramą" na dole trasy był piąty i tak jak nam kibicom obiecał silnymi pociągnięciami za szoty pchał swego Finn do przodu chcąc przed nawrotem zyskać jeszcze jedno miejsce, aby płynąc drugą halsówkę kontrolować sytuację z przodu stawki. I wtedy zdarzyło się nieszczęście. Chwilowe osłabnięcie siły wiatru, w żargonie żeglarskim nazywane "dziurą", spowodowało, w momencie gdy Piotr, po potężnym pociągnięciu za żagiel, wykonał ciałem rzut na burtę, aby wybrany grot przez kiwnięcie całą łodzią dodatkowo przyspieszył łódkę, że Piotra Finn wywrócił się na nawietrzną. Po postawieniu łódki starał się gonić rywali i na ostatnim trzecim kółku zbliżał się do środka stawki, gdy zdarzyło się kolejne nieszczęście, tym razem spowodowane sytuacją przed Piotrem. W trakcie okrążania ostatniego znaku kursowego, któryś rywal z przodu wykonał zwrot przez rufę mało precyzyjnie i jego łódź gwałtownie wyostrzyła. Płynący za nim zawodnik z Ukrainy, aby nie wpaść na rywala, gwałtownie skręcił tuż przed rozpędzonego Piotra, który nie miał dość czasu i nie dał już rady go ominąć. Doszło do kolizji co spowodowało, że Piotr nie ukończył wyścigu. Ta cała sytuacja bardzo go zdeprymowała. Zawiedziony utratą dobrego miejsca i spotkanymi problemami nie był chyba w stanie zostawić za sobą problemów z pierwszego wyścigu i wystarczająco skoncentrować uwagę w wyścigu nr 2. Dodatkowo przed drugim wyścigiem, wbrew prognozom osłabł wiatr. Miało wiać tak jak w pierwszym: 15 - 16 węzłów i Piotr wraz z trenerem uznali, że osłabnięcie jest chwilowe, zostawiając na maszcie silnowiatrowy żagiel. Jednak, zmiana okazała się trwała i cały wyścig wiatr wiał z prędkością tylko około 11 węzłów. Ci, którzy zmienili żagiel skorzystali, a Piotr mimo walki i zajmowana przez prawie cały wyścig miejsc w okolicy 11. i 12., stracił zajmowaną pozycję na ostatnim pełnym kończąc wyścig 16. Podobno w żeglarstwie regatowym nie wolno mówić o szczęściu, czy nieszczęściu, ale można chyba powiedzieć, że Piotr miał w swoim inauguracyjnym starcie trochę pecha. Miejmy zatem nadzieję, że swój limit pecha na igrzyskach wyczerpał i teraz będziemy widzieli już Piotra takiego, jakiego poznaliśmy ostatnio przy okazji Mistrzostw Świata. Przed nami drugi dzień rywalizacji. Trzeci wyścig regat olimpijskich rozpocznie się około godz. 14.00, a czwarty pojedynek planowany jest na godz. 15.30. Trzymamy kciuki za Piotr Kulę! It was perfect day for Jonas Høgh-Christensen (DEN) as he won both races in the Finns on the opening day of the London 2012 Olympic Sailing Competition, leading both from start to finish. Ben Ainslie (GBR) was second in both races and Ivan Kljakovic Gaspic (CRO) was third in both races, but each of them had to fight hard for every place. The Finns opened the sailing at the 2012 Games with a tricky and tough race on the Nothe course area, with a grandstand of 4,500 people cheering from the grassy bank beside the Nothe Fort. The 24 Finns, decked out in their Olympic coloured banners on the sails and hulls made for a very pretty picture against the stern backdrop of the Portland harbour wall and the Nothe Fort. In race one Jonas Høgh-Christensen (DEN) won the pin with Florian Raudaschl (AUT) just above him. Ben Ainslie (GBR) started mid line and then seemed to favour the right side of the course. With the wind gradually increasing from 11-12 knots up to around 16-17 knots and gusting a bit more, the 2012 Games had opened with tough hike-out upwind followed by a physically testing free pumping downwind leg. Given the often shifty nature of the wind on the Nothe course it was interesting to see that the fleet was almost evenly split across the course area going upwind. 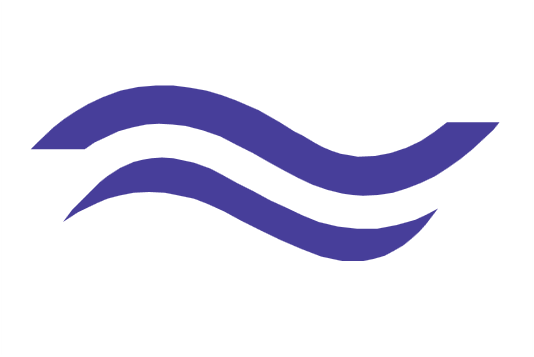 Høgh-Christensen judged the first beat perfectly to lead round from Raudaschl and Ioannis Mitakis (GRE), who are both sailing in their first Olympics. He sped away downwind and was never really threatened to win the race by a margin of around 20 seconds. Raudaschl sailed well to stay near the front, though he finally slipped to sixth on the final downwind while Mitakis hung on for fourth. Ainslie rounded in tenth but pulled up to third at the first gate with some superb downwind sailing. He went right on the second beat and again lost places back to sixth. He pulled back up to third on the next downwind, but Ivan Kljakovic Gaspic (CRO) had found a way into second. Ainslie finally went left on the final beat and maintained his place, and then moved into second on the final downwind with Kljakovic Gaspic crossing in third. The second race, sailed out in Weymouth Bay in slightly less wind, though still with Oscar flag up for free pumping, followed a similar format with Høgh-Christensen winning the pin again and sailing away from the fleet. He rounded the top mark with a 30 second lead over Ainslie in second. Casey rounded in third, but his makeshift repairs were not holding well and he slowed up and dropped to seventh as seawater found its way into his boat. Kljakovic Gaspic worked his way up to third on the second beat, but couldn't catch the two leaders with Høgh-Christensen holding on to a 19 second lead from Ainslie who was nearly a minute ahead of Kljakovic Gaspic at the finish. Ainslie had made inroads into Høgh-Christensen's lead but just couldn't quite catch him. Of course it is worth remembering that the four time Olympic medalist Ainslie has just sailed his best opening day ever - by a long way – at an Olympic Games. At previous Games he has always picked upp high scores or had some misfortune. Ainslie said, “It wasn't the greatest of races in the beginning, but that spurred me on. I have been better, but it is where you finish.” The crowd on the Nothe provided encouragement. “I could hear it clearly and it really spurred me on.” On Høgh-Christensen's performance he said, "I think he is doing the best he can for himself right now.” It was also reported that Ainslie headed to the physio after racing to have a look at his knee. Races three and four are scheduled for Monday, both on Weymouth Bay courses. W niecodziennej scenerii odbyło się ślubowanie żeglarskiej reprezentacji Polski, która wystartuje w igrzyskach olimpijskich. Na sopockim molo nominację biało-czerwonym wręczył prezydent RP, Bronisław Komorowski. - Jadę na piąte igrzyska, ale i nawet ja byłem tą ceremonią wzruszony - przyznał nam Mateusz Kusznierewicz (GKŻ Gdańsk), który obok Przemysława Miarczyńskiego jest największą trójmiejską nadzieją na medal w Londynie, a właściwie w Weymouth, bo tam odbędą się regaty. Para prezydencka na sopocką przystań, której otwarcia prezydent Komorowski dokonał niemal równo przed rokiem (czytaj więcej), dotarła jednostką marynarki wojennej. Gości przywitali prezydent Sopotu Jacek Karnowski, wojewoda pomorski Ryszard Stachurski oraz marszałek województwa Mieczysław Struk. Żeglarska kadra jako pierwsza spośród polskich reprezentacji odebrała nominacje na igrzyska olimpijskie. Ceremonię ślubowania otworzył prezes Polskiego Komitetu Olimpijskiego, Andrzej Kraśnicki, na którego prośbę minutą ciszy uczczono pamięć zmarłego w piątek wybitnego pięściarza i dwukrotnego mistrza olimpijskiego, Jerzego Kuleja. Prezydent Komorowski wręczył nominacje do Londynu dziesięciu żeglarzom z jedenastoosobowej kadry, którzy wychodzili po nie w kolejności alfabetycznej. W tym gronie było pięcioro sportowców z trójmiejskich klubów: Mateusz Kusznierewicz (GKŻ Gdańsk), Przemysław Miarczyński (SKŻ Ergo Hestia Sopot) oraz Jolanta Ogar, Łukasz Przybytek, Paweł Kołodziński (wszyscy AZS AWFiS Gdańsk). Z reprezentantów na uroczystość nie dotarła jedynie Zofii Klepackiej-Noceti, która już trenuje w Weymouth. - Jestem przekonany, że tysiące kibiców będą trzymać za was kciuki, a nadchodzące igrzyska będą prawdziwym świętem polskiego żeglarstwa. Życzę wam sukcesu nie tylko sportowego. Żeglarstwo to także wielka przygoda i wyzwania, jak również miejsce zawierania przyjaźni na całe życie - podkreślał prezydent Komorowski. W imieniu kadrowiczów olimpijską przysięgę złożył aktualny mistrz Europy w klasie Star, Mateusz Kusznierewicz, dla którego tegoroczne igrzyska będą piątymi w karierze, ale pierwsze w gdańskich barwach. Przedstawiciel GKŻ obiecał, a za nim uczynili to pozostali członkowie ekipy zawodniczej, że będzie respektować przepisy i regulaminy, zasady fair play oraz godnie walczy na chwałę ojczyzny i pomnażania dorobku polskiego sportu. - Mam wrażenie, że powoli nadaję się do muzeum, a nie na igrzyska. Jestem jednak dobrej myśli, bo optymalnie się przygotowaliśmy. Nie chcę nakręcać wszystkich wokół oraz siebie na złoto, gdyż konkurencja w naszej klasie jest mocna. Na pewno walczyć będziemy o podium - powiedział Kusznierewicz, który dotychczas medale zdobywał w klasie Finn - złoto w 1996 i brąz w 2004 roku. Na ostatnich igrzyskach wraz z Dominikiem Życkim dopłynął na Starze do czwartej lokaty. Medalowe szanse mają również nasi windsurfingowcy: wspomniana Klepacka-Noceti (YKP Warszawa), która właśnie na olimpijskim akwenie w Weymouth wygrała regaty Pucharu Świata (czytaj więcej) oraz Przemysław Miarczyński (SKŻ Ergo Hestia Sopot). - Zosia jest jedną z trzech głównych kandydatek do złota, choć mogą zdarzyć się niespodzianki. Zdołała już zadomowić się w Weymouth, gdzie w przeciwieństwie do kilku ostatnich igrzysk panują podobne warunki pogodowe jak w naszym kraju. To na pewno jest atutem. Jeśli chodzi o Przemka, będzie mu trudniej, bo w rywalizacji mężczyzn grono kandydatów do medali liczy 8-9 zawodników. Na pewno jest wśród nich i Miarczyński - ocenia trener reprezentacji deskarzy Paweł Kowalski. Olimpijczycy na zakończenie sobotniej ceremonii złożyli podpisy na polskiej fladze, a poza symbolicznym piątym kółkiem olimpijskim otrzymali również list gratulacyjny. Do Londynu udawać się będą w grupach. Pierwsza, w której będą Kusznierewicz i Życki oraz Tomasz Chamera, dyrektor PZŻ i pracownik AWFiS Gdańsk wyleci już jutro. Ten ostatni będzie kierownikiem ekipy, a dzisiaj w imieniu trenerów złożył ślubowanie. Obiecał troskę o zawodników i dobro polskiego sportu oraz sumienne wykonywanie obowiązków. Regaty olimpijskie rozegrane zostaną od 29 lipca do 11 sierpnia. W programie jest dziesięć konkurencji. Polacy zaprezentują się w ośmiu, co jest rekordową liczbą odkąd do olimpijskiego startu wprowadzono kwalifikacje. Nie będziemy reprezentowani tylko w męskiej klasie 470 oraz w żeńskiej Elliott 6 m. Łącznie w Weymout zaprezentuje się 237 żeglarzy i 143 żeglarki.